New partnership which had previously traded as Cork, Edge & Malkin from 1861 - 1871 at only the Newport Pottery. Worked in domestic earthenwares. Became a Ltd. Co. in 1899 but in 1903 the Newport works were taken over by taken over S.W. Dean. 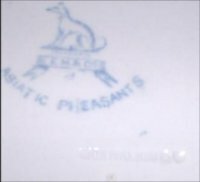 Although there are "Asiatic Pheasants" marks relating to the Edge & Malkin & Co partnership the pattern does not seem to have been continued by their successors.